When Wim van der Spek (a qualified master brewer) and Sue Cooper (a community development practitioner) crossed paths in Nepal, they’d never have guessed that their future would also be spent up in the clouds. 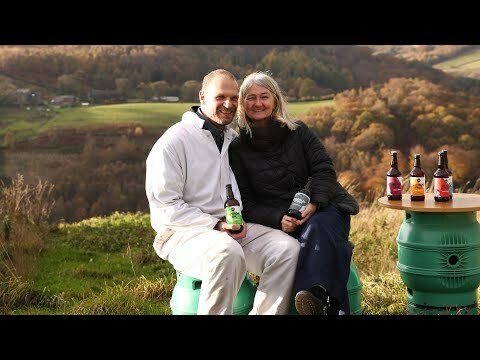 Since 2005, high up on the Pennine moorland of Cragg Vale, West Yorkshire, they’ve crafted vegan-friendly organic beers. When it comes to organic brewing, a few things come top of the list for Sue. “It’s good that we can trace all the way back from where it’s grown, how it’s grown, all the way through to beyond our use. So we even know where the spent grains go once the farmers take it away for their cattle,” she explains. When they had met, Wim was reaching the end of a seven month-long cycling trip from Holland to Kathmandu, while Sue was about to undertake the journey home to England. Sue’s take on this chance meeting some 13 years ago?